Gate Lodge Guest House limits bookings to 2 or more days. Ground Floor, Twin Bedded Room overlooking our Award Winning Garden. Suitable for Part-time Wheel Chair Users with only 2 steps into the Dining Room or, if preferred, an Exterior Ramp is available. Full Access statement is available upon request. 1. Premier Twin limits bookings to 2 or more days. 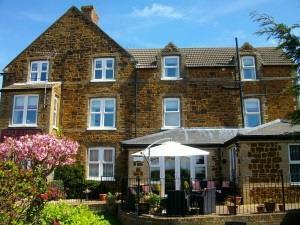 Ground Floor, Standard Double Bedded Room overlooking our Award Winning Garden. 2. Double limits bookings to 2 or more days. First Floor Standard Double Bedded Room facing West with beautiful views over the rooftops of The Wash.
3. Double limits bookings to 2 or more days. Flat Screen Television with Freeview and DVD Player .Bath and Shower Ensuite with Fluffy Bathrobes. 4.Luxury Double limits bookings to 2 or more days. Superb accommodation with a friendly, relaxing atmosphere and all those little extras you would expect from our Gold Award. To check 'up to the minute' availability, tariff and also to book online please visit our website on www.gatelodge-guesthouse.co.uk and click onto the "Availability" button. From Kings Lynn, take the A149 to Hunstanton. At first roundabout on the edge of the town take second exit (Oasis Way) to the South Beach. At the next roundabout by Tesco take third exit (Southend Road). Continue along this road for a quarter of a mile. Gate Lodge is on the right hand side, just before the junction with Le Strange Terrace. Our small private car park is off Chapel Lane; turn right just before Gate Lodge. Please note that onsite parking is on a "first come, first served" basis.